In this week’s episode of Mad Genius Tips, F&W’s Justin Chapple reveals the easy way to make no-cook tomato sauce with just a box grater. Because turning on more burners than absolutely necessary is the last thing you want to do on a super-hot summer day, here are seven more great no-cook sauces. Store-bought baba ghanoush and canned chickpeas flavor this easy sauce. It’s creamy, lemony and delicious. Umami-packed sun-dried tomatoes give intense flavor to this silky sauce. 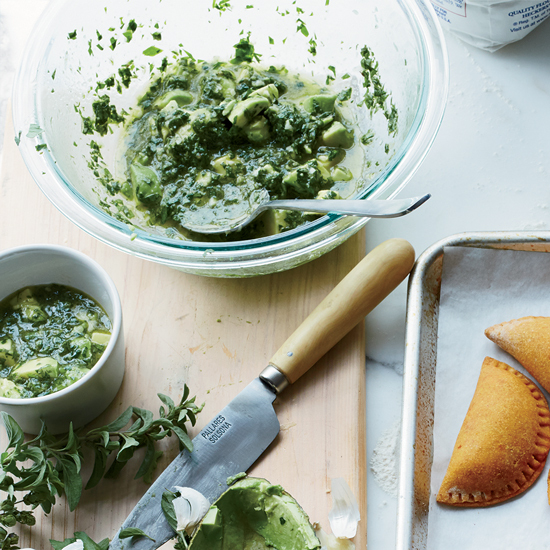 This take on the classic Argentinean herb sauce includes chunky avocado. It’s great with grilled meats. Blending spiced tahini sauce with whole-milk yogurt makes for an extra-creamy sauce. Serve it with lamb shwarma. Paprika, cumin and ginger lend their aromatic alchemy to a simple tomato sauce. This vibrant green sauce is terrifically fresh-tasting and versatile—have it with fish or pasta, or drizzle it over a Caprese salad.